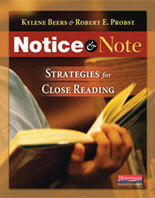 Like Notice & Note did for literary texts, Reading Nonfiction introduces signposts that support the close reading of informational texts. 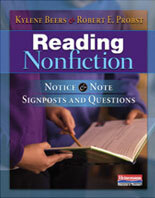 Because we read nonfiction for different purposes and with a different point of view than literature, Kylene and Bob also share three essential questions that the nonfiction signposts each lead to, ultimately supporting an informed, mature, sophisticated reading of nonfiction texts. All in the service of helping kids challenge the texts they read, change their own minds about a subject, and even change the minds of others.